Notre Dame Uniform & Helmet Starter Doormat - 19" x 30"
Home >	Notre Dame Uniform & Helmet Starter Doormat - 19" x 30"
This Notre Dame Uniform & Helmet Inspired Starter doormat will be a great addition to the house wanting to show their support for their favorite college. 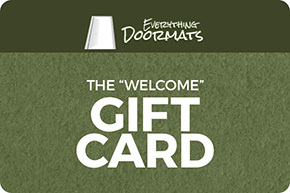 This starter mat is the perfect addition for any home wanting to dress up their interior decor. Made with nylon carpet fibers this doormat is perfect for use on the interior of your homes entries. The nylon carpet fibers are an industry standard which brings both exceptional functionality and robust sturdiness all while showing your family, friends, and neighbors where your loyalties lay. This Norte Dame Helmet inspired Starter doormat comes in a 19" x 30" size.